It’s been exactly two months since SLEEPY HOLLOW’s first season concluded, and production on the upcoming season is still in the earliest of stages. So with months (and months and months) to go before viewers get SLEEPY HOLLOW season 2, what are fans to do to pass the time? Well, there’s some good news: before Wednesday’s PaleyFest panel honoring the series, SLEEPY HOLLOW boss Mark Goffman teased they do have some fun things in store to help make the wait a little less torturous. 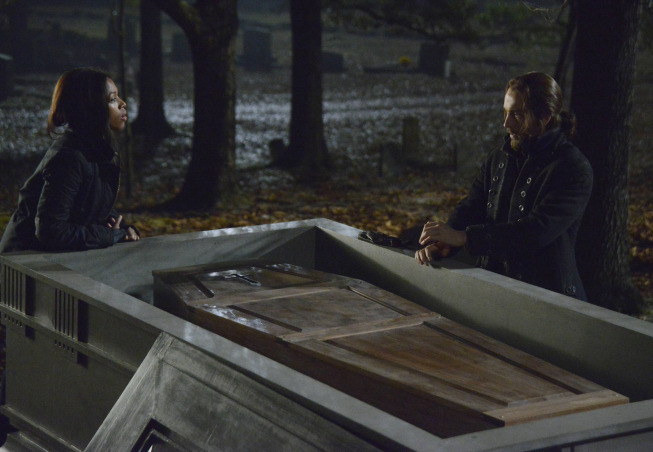 We still have to wait three weeks until the next new episode of SLEEPY HOLLOW, but in the meantime, we have these very interesting photos from “The Vessel” to keep us busy. SLEEPY HOLLOW: ‘The Golem’ Photo Preview — John Noble Returns!